Launch of e-commerce website for our friends fairandfunky! 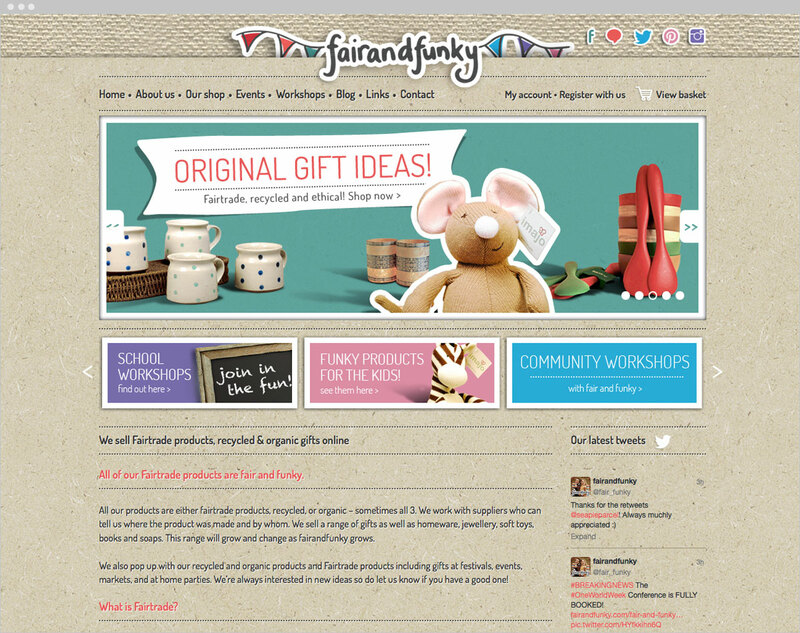 Launch of e-commerce website for our fairtrade friends fairandfunky! We were asked to design an e-commerce website for ‘fairandfunky’ which is run by two very enthusiastic and passionate women, Helen Robinson and Sophie Bebb. fairandfunky is a community interest company with the mission statement: empowering people to take little steps to change the world. And that they are doing! The e-commerce website is a platform to sell products that are recycled, fairtrade, or organic – sometimes all 3. They work with suppliers who can tell them where the product was made and by who. They sell a range of gifts and products including homeware, jewellery, soft toys, books and soaps. The e-commerce website also promotes and tells people about the many events and clubs they organise. fairandfunky deliver interactive workshops on 3 key global themes: ‘recycling’, ‘the environment’ and ‘Fairtrade’ to schools and community groups. The workshops range from creative arts to debates from roleplay to junk modelling with a difference. They also host regular “fairandfunky craft club” sessions in the local area and have recently organised a fairandfunky family fun day! The fairandfunky logo came from their own original drawings. Helen and Sophie would go to markets or pop-up events to sell their products and would hand draw their logo on tags – this we felt was unique to them and important to keep. The design of the e-commerce website reflects their message. We gave the site an organic and recycled feel mixed with bright colours and engaging banner images – this, we feel, lifts the vibrancy and energy of the site. The website is built in wordpress and there are lots of things that can be controlled and edited very easily by Sophie and Helen – allowing them to keep their content fresh with upcoming events and adding the latest products to their online shop area. The launch party was a great success and the website is fully up and running and taking lots of sales online already! Twitter has been buzzing with congratulations and complimentary feedback recently and social media has played a big part in helping Helen and Sophie get their message out there. Check them out on twitter @fair_funky and their facebook page /fairandfunky.